Over 130 delegates descended on Bristol last Friday 23rd October for the 6th Civic Voice Convention and AGM. After a comfortable first day with interesting tours around the town it was a quick freshen up and off to the conference dinner where two mayors welcomed the delegates. First the Elected Mayor George Ferguson, whose inspirational address encouraged us all to get involved in shaping our towns, followed by the Lord Mayor Cllr Clare Campion-Smith who welcomed us to the city and wished us an interesting and successful conference. The theme of the conference centered around planning, placemaking and street design, with several workshops concluding that local people, passion and participation are crucial to successful places and development. A highlight for Marple Civic Society was the Marsh Civic Volunteer Award 2015 to our chairman Gillian for her contribution to the civic movement. Colin Davies of the ‘Public Realm Information and Advice Network’ drew attention to the fundamental change in attitudes to street design taking place amongst transport planners. He stressed that much could be done relatively cheaply by taking a staged approach and involving the community. See HERE to view the guidance document "Street Design for All". Civic Voice is working with Historic England, Imperial War Museum and the War Memorials Trust to support communities that want to conserve, protect and learn more about their local war memorial. Civic Voice’s Anna Wilson ran a workshop to discuss the conservation issues faced by memorials and to inform delegates how they can be involved in war memorial conservation projects. Further information can be found HERE . The final workshop considered five topics to prioritise Civic Voice projects for 2016. Placemaking ranked no.1 so we can expect a series of talks, workshops, debates and lobbying at government level in the coming year about all aspects of placemaking. The society's October 2015 Newsletter is now available. See front page below for details of contents. 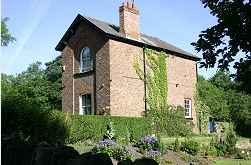 The society's planning team has sent a response to Stockport MBC's Planning Department to recommend the refusal of planning application DC/059185 - Garden House, Lakes Road, Marple. 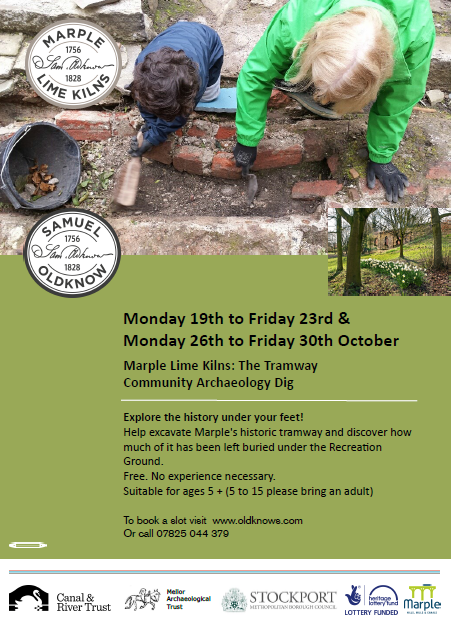 The first community dig at the Lime Kilns, as part of the Revealing Oldknow's Legacy project, starts on Monday 19th October. The top soil has been removed in preparation and cabins set up for school children visits and volunteers to take part in the dig over the next two weeks. Free - No experience necessary - For more details see poster below. At the end of the dig we'll be exploring what's been uncovered at the Tramway Open Day on 1st November - for one day only. With a special guest from the past, this is an event not to be missed. Guided tours will take place throughout the afternoon around the Lime Kilns and site of the dig and Sarah Cattell - the archaeologist leading the dig - will be on hand to chat to. A meeting with ASDA was arranged by the civic society and took place in Marple's Senior Citizens Hall on Tuesday 13th October 2015. Alan Jones, senior property manager and Wayne Gleeson, general store manager were joined by Jenny, the community life champion and Andrew Lester from Hardhat, consultants for ASDA. 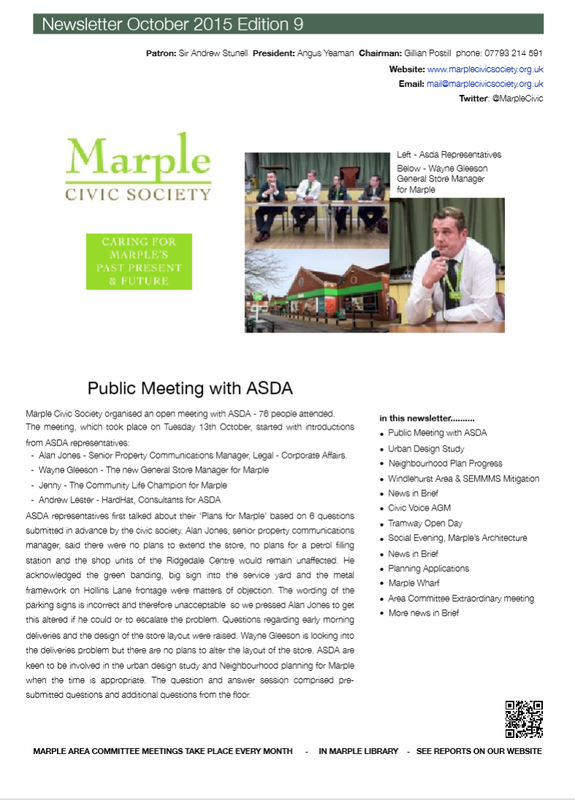 The meeting started with ASDA representatives introducing themselves, explaining their roles and a short presentation based on questions handed to them from the civic society. A Question and Answer session followed with both pre submitted questions and questions from the floor. Don't miss out on your opportunity to receive a FREE National Trust Pass. If you are a member of Marple Civic Society you are eligible for one of these passes. Simply send a stamped addressed envelope to 60 Duke Street, L1 5AA to request your pass. The society's annual social evening took place on Thursday, 8th October 2015 in Marple Library. It was great to see so many friends and to welcome newcomers. Speaker Anthony Burton gave a fascinating presentation about Marple's architecture. The talk concentrated on domestic buildings from 17th century farms, early industrial houses to commuter villas and 20th century overspill estates. Anthony drew particular attention to the architecture of Samuel Oldknow, an interesting mix of styles referred to by our speaker as "Oldknow Vernacular"
The talk was followed by an interesting discussion about our architectural heritage, what we can learn from the past and how we manage the sometimes difficult relationship between architects and planners, in order to achieve satisfactory design and development outcomes for society. Marple Civic Society formally handed over their painting of Mellor Mill, painted by Joseph Parry c.1800, to Stockport MBC on long term loan for display in the Staircase House Museum. The Mayor and Mayoress of Stockport accepted the painting on behalf of Stockport MBC from the society's president, Angus Yeaman. The painting was donated to Marple Civic Society by member Mrs Barbara Sexton, wife of Basil Sexton, a founder member of the Civic Society in the 1960's. We are very grateful to Mrs Sexton for her kind and generous donation. The painting was purchased by Mrs Sexton in 1958 from an auction sale at Abney Hall in Cheadle. Abney Hall was purchased in 1850 by cotton magnate Sir James Watts and remained in the Watts family for several generations until 1958 when it was sold. The painting was listed for insurances purposes by the Watts family in 1912 but it is possible that the painting belonged to the Watts family going back to the 19th century. It wasn’t unusual for artists of the time to be commissioned to paint more than one painting of the same subject but what is extraordinary is that two paintings of Mellor Mill, by the same artist and painted around the same time, should find their way back to Marple within 10 months of each other more than 200 years after they were painted and at a time when a £1.5 million Heritage Lottery funded 3 year project is being undertaken. One of the three sites of the Revealing Oldknow’s Legacy project is the Mellor Mill site and Marple now has two paintings to link to this important Marple project. The painting owned by Mellor Archaeological Trust hangs locally in Marple Library and this one belonging to Marple Civic Society will hang in Stockport’s Staircase House Museum in the newly created industrial period section of the museum. The society's annual social evening will take place this Thursday, 8th October 2015 at 7.30pm in Marple Library. In 1993 the civic society arranged a photographic exhibition of Marple's listed buildings: this talk aims to update, extend and contextualise this survey. It deals almost entirely with domestic buildings (there are few public buildings in Marple), ranging from seventeenth-century farms, through housing in the industrial period (for bosses and workers), and commuter villas spreading with the railways, to recent estates. Join us for a glass of wine, a fascinating presentation and a congenial evening. bring your friends, neighbours and relatives - they will be most welcome.